G&G 0.20g BBs, 5000 Ct.
G&G 0.25g BBs, 4000 Ct.
G&G 0.28g BBs, 3570 Ct. This version sports the highly popular Keymod modular rail system. Keymod rails allow for the mounting of all your typical picatinny/weaver compatible accessories such as tactical lights, lasers, foregrips, bipods, and more. What makes them superior to a standard RIS is their ability to be customized to perfectly fit the owner's needs while coming in a far lighter form-factor. Keymod rail sections can be mounted along the sides and bottom, only where the user needs them, and attachments are mounted to those rail sections. This also virtually eliminates the need to buy and use rail covers to protect your hands and gloves from the wear and tear of traditional RIS rails. The aluminum upper and lower receivers that made for industry defining durability while drastically cutting excess weight and costs have been even further improved by G&G. By adding additional structural reinforcement along the length of the upper receiver and lower receiver magazine well the frame of the rifle has become even more rock solid. They even went as far as to mold the magazine well to provide grip space for operators who hold the rifle high and tight. The aluminum construction is the ultimate balance of lightweight and durability. By introducing an in-line MOSFET, a specially designed circuit board that redirects the electrical current directly to the motor, the Combat Machine's internals out-perform and outlast other rifles. The MOSFET improves battery efficiency and flow of electricity, making for faster trigger response, more shots between recharging batteries, higher rate of fire, and virtually eliminating burned out trigger contacts. In addition to all of that, MOSFETs allow for the usage of high performance 7.4v-11.1v Lithium Polymer (LiPO) batteries for the ultimate rate of fire and shooting experience. G&G's Electronic Trigger Unit (ETU) is a high-tech replacement for the standard trigger set that allows for the user to fire in semi-automatic, fully auomatic, or 3 Round Burst modes. 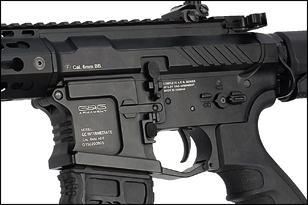 Because the G&G included the pre-wired and installed MOSFET and ETU combo, the burst fire mode can easily be enabled or disabled without dismantling or modifying the gun's internals. The bigger, better version of a crane stock was included on all SR Series Combat Machines. This multi-position crane stock can be adjusted to comfortably fit nearly all shooters for all scenarios. A locking button insures that the stock doesn't unexpectedly move when charging into battle. The crane style allows for nunchuck, crane, and short stick batteries to be stored within. An additional AAA/AA/CR123 battery storage tube can be quickly and easily opened on the fly. A QD-sling mount attachment point is also located near the buttpad. The large buttpad is securely fixed to the stock to prevent loss and is aggresively texutres to prevent slipping while shouldered on the run. G&G paid special attention to the details on the GC Wild Hog series as well. Each rifle comes with a unique serial number. The pistol grip that houses the G&G High Torque 25K RPM Motor is G&G's nylon fiber ergonomic grip that provides the best comfort and control. 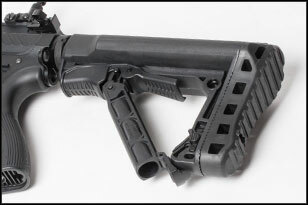 A 300 BB high capacity CMAG-V1 rubberized, ergonomic Thermold magazine was also included. An oversized trigger guard makes shooting this gun even with thick gloves comfortable and easy. Flip up front and adjustable rear sights are an excellent stand-alone sighting system that can also be used with aftermarket optics such as red-dots, holos, and scopes. The unique look of a recessed sound amplifier tucked into the keymod rail system gives the Wild Hog series AEGs a look that's sure to draw attention on the battlefield. Aluminum Keymod Rail, Aluminum Receivers, Stock, Grip.